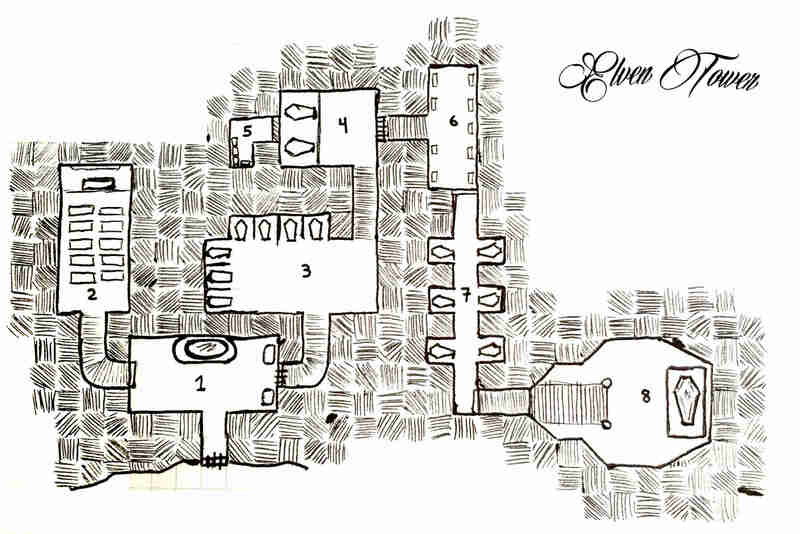 One of the projects for this site is to periodically release hand-drawn maps with room descriptions, ready to incorporate and use in mostly any game. This is the map for the king’s catacombs. All stairs descend. Thus having the royal chamber almost 4 stories below the surface. Entrance Hall.- In the center of the room there is a dais with an altar on top. The deity is of the DM’s choosing, according to content. The door on the right is locked (DC 16). Chapel.- There are 10 benches facing a tabernacle. Behind it there is a bas-relief of the family seal. Common catacomb.- There are 7 sarcophagi in this room, two are empty and the rest are currently occupied. The lids are made of unmarked stone, they are very heavy (Strength DC 15 to move). Elders room.- The two sarcophagi in this area are made of sculpted stone, depicting epic scenes of long dead family heroes. The top of the lids have embedded precious stones. Behind the sarcophagi there is a secret door (Perception DC 15 to notice), the only way to open it is to pry loose a stone on the wall (Investigation DC 14 to find it).The door on the right is locked (DC 16). Secret room.- It contains valuables from the family members that were left here to avoid theft. Most of it is art objects and old coinage. Tomb guards.- By custom, the guards of the king were buried next to the royal chamber to protect his liege beyond the grave. The sarcophagi are identical to the ones in Area 1, but these have the royal crest sculpted on the sides. Royal Chamber.- After the long stretch of stairs, on a dais, the royal sarcophagus stands, defying time and decay. Legend has it that inside it, along with the old king’s remains, there might be amazing treasures buried with him. Hi, yes it is free to use and share as long as it’s linked back here. It goes without saying that it can’t be used commercially. But sharing with a link is great. Thanks, that’s a very nice useful map! Thank you ! Thanks for following the site.